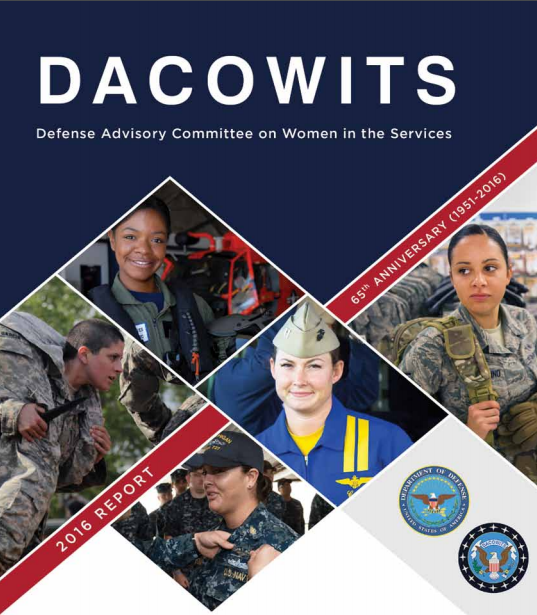 The Defense Advisory Committee on Women in the Services—known as DACOWITS—delivers to the U.S. Department of Defense advice and recommendations on policies related to the recruitment, retention, treatment, employment, integration, and well-being of the highly qualified professional women in the U.S. Armed Forces. In 2016 Insight collected and analyzed data from focus groups with hundreds of military Service members, conducted several literature reviews, and compiled findings from a wide array of data sources. Using the findings of this research, Insight’s Rachel Gaddes, Rachel Holzwart, Allyson Corbo, and Rebekah Myers prepared DACOWITS’s 2016 Annual Report, which marks DACOWITS’s 65th anniversary. The report includes 14 recommendations to advise the Secretary of Defense on the following topics: mentorship, single-parent waivers, accessions and marketing, the chaplain corps, gender integration, combat gear and equipment, pregnancy and parenthood, physical standards, strategic communications, transition services, and sexual harassment and sexual assault training. The report is now available here.